The Laos 2012 exploteam returned from a three week exploration and surveying expedition. This years expedition was a re-visit of former areas driven by the short term non-accessibility of Sayabouli province. It was also the first time two independent expedition teams were on the way. Vieng Phouka revealed shorter river caves of several hundred meter length along the roads, the surprise came in Muang Ngoy with a 2 km river system which is still going. Vieng Xay had many caves along the road to the Vietnamese border, the surprise was a new found area just 25 km North of Sam Neua with disappearing rivers. This year also marks the 10th expedition in annual succession after having the first trip in December 2002. 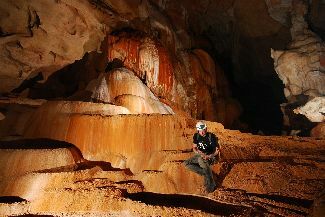 The results can be shown to the international caving community. Six provinces were visited and 92 km of cave passages mapped in Northern Laos . All work is nicely published and available as 4 BHB books “ The unknown North of Laos Vol. I – IV”.